Convert any video file on your PC into a Palm -friendly video file. · Standard AVI format, allowing you to preview converted files on your PC. 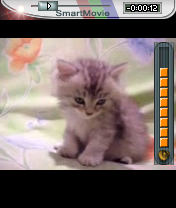 · Player uses the phone screen in portrait or landscape mode, utilizing full screen size of the device. · Rescaling of video to utilize full-screen area. · PC converter allows you to split video file into multiple segments, so that it fits onto your memory card, if not entire, then cut to more parts - you may watch your favorite video in parts, e.g. while traveling to work/school. · Support for subtitles - allowing you to watch movies in different languages. · Friendly PC converter - preview videos on PC, select parts you want to convert, alter quality. · Supports DirectShow codecs, so you may use video codecs downloadable from the internet. · Bicubic rescale algorithm shrinks video to small screen size in best possible quality. · Adjustable quality parameters for video and audio streams, allowing tuning target video to your needs. · Customizable video Player (brightness, language, volume, and more).